Nic Nassuet, for most of his life, was a Hollywood-based musical actor starring in such plays as Sweeny Todd: The Demon Barber of Fleet Street, Sideshow and Doomsday Cabaret. He was known onstage for his powerful vocals and macabre presence, but now Nassuet has begun a new chapter in his life as a solo artist and from the looks of it he is doing pretty well at that too. He has named his unique style “goth folk,” though it feels more like mellow indie rock with a bit of goth and folk sensibility. The goth may simply be in the black and white sugar skull makeup he dons in his performances and a personal style preference rather than anything musical. 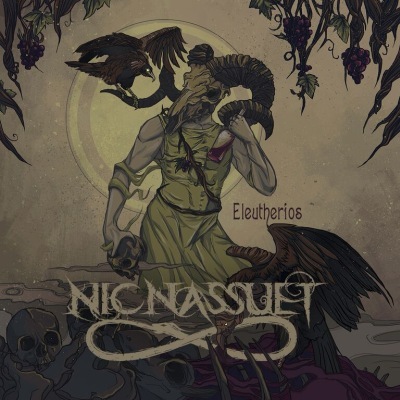 Nic Nassuet’s first full album is entitled Eleutherios and is mostly a compilation of singles he released beginning in September 2014. Releasing each single individually garnered him quite a bit of airplay from local radio stations as well as from streaming stations worldwide. Now with the final few single releases and the addition of some new tracks just for the album, Eleutherios has already gained Nic Nassuet quite a few accolades, such as induction into the Recording Academy (Grammys), the Akademia Music Awards for Best Folk/Alternative Rock Song and Best Song and three Indie Music Channel Awards Nominations. Nic Nassuet’s sound employs a number of styles and influences, but it is largely indie folk-based. With a little bit of both American and Celtic folk, some rock guitar styling and classically-composed string pieces, Nassuet’s style can be all over the board at times but what sets him apart and has garnered so much critical acclaim has been his songwriting ability. The way he is able to put together all the different layers in his compositions shows the training he has had in the theatre to have really paid off. He is able, sometimes only with basic instruments and questionable vocal quality, to connote the power and emotion he wants to get across. Despite a few technical glitches, this powerful compositional ability is what really shines through. Eleutherios opens with Cross and Crown, a short piece which introduces Nic Nassuet’s unique style to the world but which also exposes a few recurring problems in his delivery. Though all that is presented instrumentally on the track are Nassuet’s somewhat average guitar playing and a backing violin, his vocals seldom stay on key, even in the quiet intro. He then takes on an odd-sounding, raspy and off-key falsetto which, given that Nassuet is known for his pitch-perfect vocals in the theatre, may be part of some sort of rock persona he is trying on. His performing partner Catrina Grimm has a flawless voice, so it makes Nassuet’s off-key wailing all the more palpable. What saves this track as well as many others is the song composition, which despite the glaringly off-key vocals makes Cross and Crown a decent track. This clash between Nassuet’s sort of 80s rock vocals and the music and composition is apparent on other tracks on Eleutherios, such as When It Falls, Immured, Down and Black Dress. Not all of the songs have the same issue, however. In The Nothing, for example, all of Nic Nassuet’s vocals are very much on-key, and in fact he sings with an almost operatic tone and technique. Other songs like The Giver and She Rides Moonlight show that even with soft, folkish tones Nassuet is indeed capable of staying in tune with the music. This contrast in vocal quality creates a bit of a conundrum which will have some listeners scratching their heads. Even stranger still is the fact that many of the songs with vocal tone issues are more emotive and interesting compositionally than the songs with flawless technique. Images courtesy of Nic Nassuet’s press kit.